LA Lakers – Now don’t be hissing at me, people. 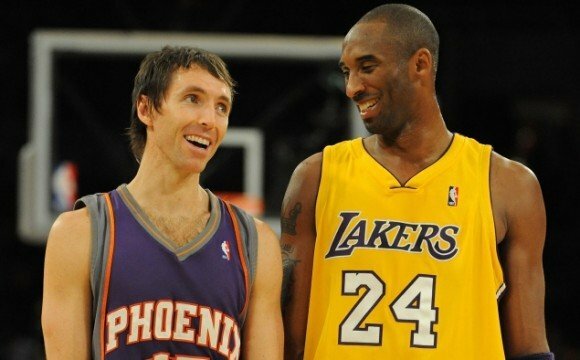 They may have just signed the coveted Steve Nash, who will no doubt make them favourites in the West, but at what cost? Nash, 38, will help them contend for a few years but after that they may be regretting those two first round draft picks (aka two soon-to-be prospects) and two second rounders (aka two soon-to-be decent players) that they gave up for a point guard who’s past his prime. Really, in any sport, giving up that much for that little would be a steal for the other team and in this situation, it’s no different. No doubt, LA will help themselves with a stacked starting group (most notably Kobe and Nash) in the short term but you’ve got to always be thinking about the larger picture. This immediately puts Phoenix on the rebuild track and ready to compete a couple of years. Toronto Raptors – Toronto is now without Kid Canada and Colangelo looks like an idiot. After signing Landry Fields to that lucrative deals just days ago, in what was supposed to be an attempt for the Knicks to avoid a sign-and-trade, the fact that Nash hasn’t signed to his native country puts the GM’s head on the chopping block. They tried, but failed. The culture was supposed to be different, Toronto was supposed to finally become relevant again and Nash was supposed to retire in a Raptors uniform. The dream story didn’t work, despite Nash being thrown a big wad of cash. He chose contender over money and Kobe over Andrea. Now, the Terrence Ross signing looks ridiculous and Toronto is back to phase one. Steve Nash – It must feel great to be on a contending team. The ring-less point guard finally has a shot, and a damn good one, of winning it all next year with a group that includes Kobe Bryant, Pau Gasol and Jack Nicholson. Nash chose ring over money, and can you really blame him? He’s got the money of 16 seasons in the NBA, now he just wants to drink the forbidden juice. New York Knicks – Phew, no Iman Shumpert involved, luckily they didn’t do anything stupid. The Knicks now need a number one point guard, so they’ll go out and get one. Mind you, Lin ain’t so bad, and can probably start if need be. Most importantly though, the Kicks didn’t overpay for an old veteran, which will be better for them in the long run. Fans of the NBA – So, folks, you have just seen a future hall-of-fame PG go to a team with a couple futures of its own. The Nash-Kobe factor can only be compared to the Dwayne-‘Bron factor on the Heat. Get ready fans, next year is going to be an excellent year for the NBA.